When your child doesn’t finish their dinner, nibbling the leftovers is a common habit for mums and dads. Not only that, shopping for children almost always adds sugary treats and fatty snacks to the trolley that our fridges and waistlines could do without. Unfortunately, this combined with clothing them and driving them about amounts to not much spare time for the gym. If this sounds familiar, you might be missing a trick. When you take them to the park, let them loose in the garden or go swimming what do you do? My money is on you sitting on a bench, doing the ironing or watching them splashing about through a Perspex window, with a coffee in hand. What is stopping you joining in? I’ll bet that you have a basic understanding of most of the sports they play; you might have even been a netball star back in school. I’d stick to the more traditional games of tennis, football and hockey as ‘crab football’ is definitely not for the elderly; i.e. the over 30s! Dust off your trainers, walk to your nearest green space and get the whole family moving; you won’t even notice how many calories you are burning off by trotting back and forth to the pram, chasing the astonishingly quick older ones around, giving your husband the odd dirty tackle and sprinting after the dog that’s stolen your ball. Get involved in what is going on in their sporting worlds. If you’ve got a son or daughter who needs a bit of practise batting or bowling, you could be the one that helps them get selected for the team this year. Don’t just send them off for a swimming session when you have to sit and wait for them anyway; dive in! Your partner might think you’ve gone a bit mental but I’ll bet they’ll appreciate the re-emergence of the sprightlier you. 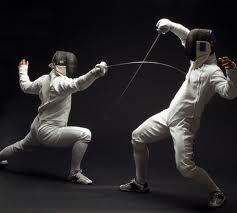 When we fancy a sporting session we usually go for a knock about on the tennis court or a kick around on the football pitch, never have I heard someone say, “Let’s have a quick bout on the strip.” Derived from both French and Italian swordsmanship, Fencing has come a long way from the life or death situation of a Duel. It is nowhere near as popular as it deserves to be, so I decided to go for a quick refresher session to find out if it is as fun as I remembered at school. It is no wonder that you might be put off the sport by the outfits you have to wear; a bee-keeper type mask, straitjacket and either a very Clockwork Orange-esq cod-piece or plastic chest protectors! When I was suited and booted I picked up my foil, this is the lightest of weapons and is easy to move around to learn and practise the various positions, and we began to twist our wrists back and forth to piece together basic defence and attack positions. Initially, I was discouraged by the amount of French used to describe blocking positions but these can easily be transformed into numbers. Once you have learnt a few ways to block your opponent, and remembered to riposte (attack) straight afterwards, you start getting competitive. Combat is the original form of competition and this is certainly an elegant way to entertain that primal instinct. Brute strength is not an advantage here; this is a sport for the resourceful. Fencing teaches control, technique and sharpens your senses. Posture is imperative, as is quick footwork and short bursts of power from your legs. This type of exercise will get your heart rate up and push your muscles to the limit, as you reach for that elusive winning point. Absolutely anyone can have a go and everyone will improve their lightness of foot and probably their French too! Fitness article provided by Walmley Pages, sutton Coldfield community magazine advertising local business to the Sutton Coldfield public.